Majority of houses being purchased nowadays are financed through home loans which are often 4-5 times of annual income of a person and are taken for a long period of repayment like 20-25 years. The recent twin building collapse in Shahberi village of Greater Noida has once again brought the matter of illegal construction and use of inferior quality materials in the building construction to the fore. Rather than enjoying the comfort of their new homes, the occupant families are coping up with loss of life and fortune. Not only did many families, who purchased a flat in that building, lose their homes and savings but they will also have to pay big outstanding loans. Buying a house is the biggest decision of life for most of the homebuyers. Majority of houses being purchased nowadays are financed through home loans which are often 4-5 times of annual income of a person and are taken for a long period of repayment like 20-25 years. 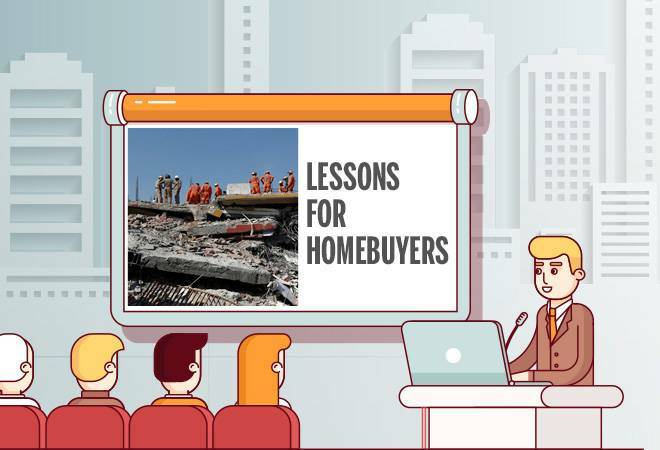 This incident should work as good lesson for prospective homebuyers that a wrong decision will not only have its immediate financial risk but can have its impact for a longer term. Take the pain earlier to avoid post stress: It makes sense for you to take all the precautions before you go ahead with buying a new property. You should not leave scope for any complacency or ignorance while scouting for house. Rather than regretting at a much later stage, it is better to take all the pain before buying the property and ensure that it has all the legal approvals and its construction quality is reliable and has complied to all the laid down norms. Avoid any sense of urgency: Often first time home buyers go through a sense of urgency that they will not be able to catch up with prices later on if they miss the bus now. This gives them no opportunity to focus on all the critical issues related to the home purchase that can have long term repercussions. The experience of real estate market in India has shown that overheating of prices is followed by a period of correction or price stagnation. Therefore you will always get another chance if you wait with caution. But if you become complacent regarding the important aspects like checking the construction and quality and legality of the building then you may not get another chance to recover. Getting a home loan is no guarantee of legal clearance: It is often considered that if your home loan is disbursed by the lender for your new house then it is a kind of assurance that the building is legal. However, it is far from the truth. The homebuyers in Shahberi village incident also got home loan sanctioned but the building lacked many other approvals. So even if the lender has approved your loan you should not throw caution out of the window. Get all the documents verified: Before giving any advance you should make it a point to ask your builder to give you the copy of all the property related papers including title document of the building, its devolution history, proof for residential nature of the land, local area layout, approved building layout plan and completion certificate. It would not be a bad idea to spend some money and consult a good legal expert and take his/her opinion after showing all the documents. Be vigilant while inspecting the quality of construction: If the construction quality of a building has been compromised there is good likelihood of it leaving some obvious defects which can be visually observed. "Some of the way in which buyers can effectively assess the security and safety of a building is by visual inspection of property to observe obvious defects, deterioration, dampness, exposed reinforcement, corrosion etc. You can observe the patchwork and colour coats in order to check if some defect is concealed," says Ashutosh Limaye, Head Research & REIS, JLL India. You can make multiple visits to the prospective house or construction site to make sure that no obvious defect remains undetected. Get the expert to check the building structure: You can get in touch with an expert of check the durability and construction quality of a building especially if it is a new construction. "If it is a new building you can ask for working drawings/ structural drawings and get them validated by structural engineer," says Limaye. Be over cautious while buying an old property: Age of construction also gives you the idea about the strength of the building. In old buildings, the upkeep and maintenance become very critical point determining the strength of the construction. According to Limaye, if a building is over 30 years old, always better to call a structural engineer for a visit for inspection. You can ask for records for society for major repairs done. Check the drainage system: One of the major flaws, which adds to structural corrosion of a building, is lack of proper drainage system and leakages in water supply. You should do a thorough check of building drainage system and make sure that it is linked to government approved drainage system.